The 1983 Richmond Report recommended the NSW Government fund a system of community-based networks, backed up by specialist hospital and accommodation services. It was called deinstitutionalisation but while the cutting institutions bit was enthusiastically embraced by Government, the funding of community based replacement mechanisms never found political support. Ten years after the Richmond Report, Brian Burdekin conducted a national inquiry into the rights of people with mental illness and found little progress. Twenty two years on, reading the Spring 1993 Inner Voice report below it is interesting to see what has and has not changed. The national inquiry into the rights of people with mental illness, chaired by Federal Human Rights Commissioner Brian Burdekin, brought down its report in mid-October. • The mentally ill suffer from widespread, systematic discrimination, and are consistently denied their rights. 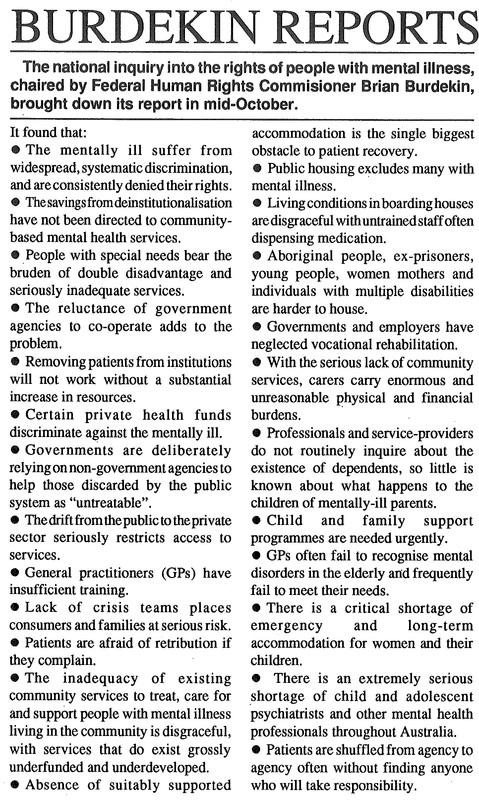 • The savings from deinstitutionalisation have not been directed to community-based mental health services. • People with special needs bear the bruden of double disadvantage and seriously inadequate services. • The reluctance of government agencies to co-operate adds to the problem. • Removing patients from institutions will not work without a substantial increase in resources. • Certain private health funds discriminate against the mentally ill.
• Governments are deliberately relying on non-government agencies to help those discarded by the public system as “untreatable”. • The drift from the public to the private sector seriously restricts access to services. • General practitioners (GPs) have insufficient training. • Lack of crisis teams places consumers and families at serious risk. • Patients are afraid of retribution if they complain. • The inadequacy of existing community services to treat, care for and support people with mental illness living in the community is disgraceful, with services that do exist grossly underfunded and underdeveloped. • Absence of suitably supported accommodation is the single biggest obstacle to patient recovery. • Public housing excludes many with mental illness. • Living conditions in boarding houses are disgraceful with untrained staff often dispensing medication. • Aboriginal people, ex-prisoners, young people, women mothers and individuals with multiple disabilities are harder to house. • Governments and employers have neglected vocational rehabilitation. • With the serious lack of community services, carers carry enormous and unreasonable physical and financial burdens. • Professionals and service-providers do not routinely inquire about the existence of dependents, so little is known about what happens to the children of mentally-ill parents. • Child and family support programmes are needed urgently. • GPs often fail to recognise mental disorders in the elderly and frequently fail to meet their needs. • There is a critical shortage of emergency and long-term accommodation for women and their children. • There is an extremely serious shortage of child and adolescent psychiatrists and other mental health professionals throughout Australia. • Patients are shuffled from agency to agency often without finding anyone who will take responsibility.